I thought it came out very well myself. Admittedly, smacking a render with the Oil Painting filter in SnapArt in Photoshop goes a *long* way toward improving the look of old models with painted-on fur, but not all of one's projects are really eligible for "artifying". I think I can deal with this. It will take a certain amount of twiddling, but the results are good enough from blundering about not knowing what I'm doing, to keep me trying. Mind you, I think I'm going to have to see what rendering it with a lower density of hair on the model with the ambient lightened and opacity lowered will do. 1,500,000 folicles is probably overkill. And the shorter hairs should probably be the denser number rather than the longer. Oh!! Oh!! I is sooooo happy !! Here's my first try with LAMH I am in love!! So AA are ya married? heeeeheeeh sorry couldn't help myself this is great!! Seriously, thanks I'm glad you are having fun with my new toy. Allow me to give a suggestion about lighting when rendering tiny bits of geometry as hair/fur. 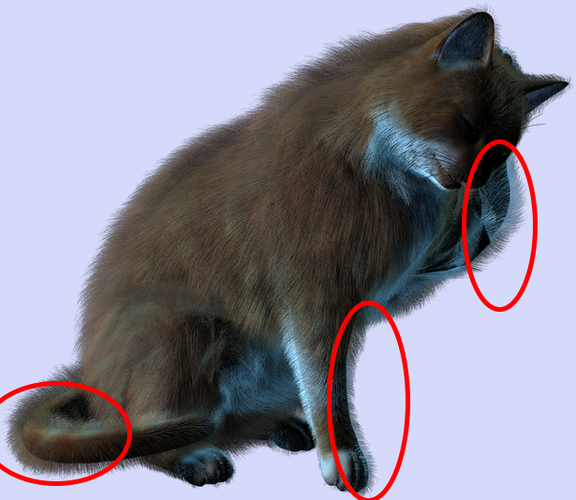 As you can see some parts of the fur are not matching the underlying model shading (I highlighted those areas in the attached image). Common practice to get a smooth shading between fur and the underlying model, is to set the model shading to "Matte", use very low Specular Intensity, and add a light that has an Occlusion component, such as the UE2. That will give a better render result. Like I say, I don't know whether I'll ever be able to render a scene with anything but the cat in it, but I can render a long-haired cat. It probably took something like 4-5 hours, but I went to bed after 3 and just left the computer chewing on it. I exported it with 1,000,000 folicles, and could still see the model inside it. So I exported another with 500,000 and let the model wear them both. Then got a bright idea (which may not be bright at all, but seems to have worked) of selecting the original figure, going into the surfaces tab, selecting the "fur" matt zone, and changing the ambient color practically to white, and lowering the opacity to about 75%. Question: why is there an inner ear zone for the hair? I turned it off on both exports, but is it a blend zone at just the edge and should be left on? Beautiful render Jodel! As I wrote to carrie58, to make the model less noticeable, or you use a very high hair count, maybe raising a bit hair width so that fur will actually cover the whole body, or you might want to try, if you already didn't, to use a light with an ambient occlusion component such as the UE2, that should mitigate the transition between fur and underlying body model. Also, in my renders I usually set the model shading to "Matte" and turn down Specular Intensity, so that the underlying surface won't be too shiny and visible through the hair. Anyway, as I said, very nice render. I'm sure it's right there in front of me, but how the heck do you open the Group Materials Setup Window?" 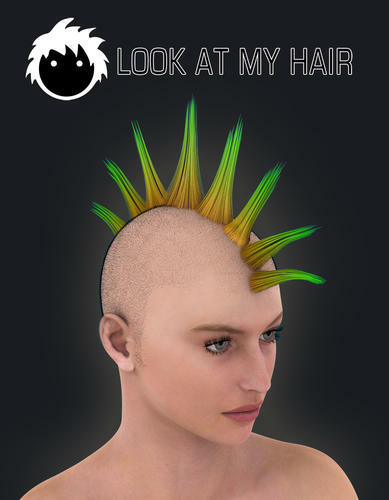 I just bought LAMH and tried several times to install it - but it does not appear to have installed, and i cant find any menu to create a new hair object. i dont know what is wrong - i looked in my directory, and the dll file is in the plug in folder - but nothing is coming up. any suggestions.? in the list of plugins it says failed to upload - that the files are not valid DAZ studio files. 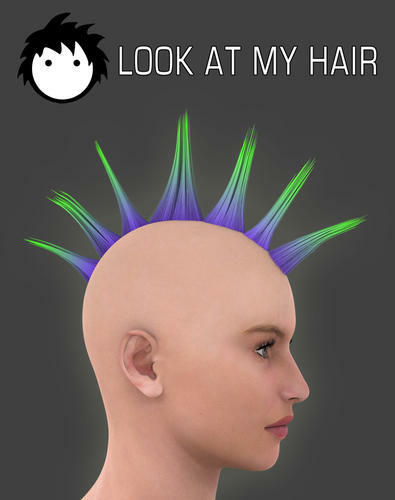 i am using daz 4 - is that the right program? Contact me via email: krsears (at) trdc.biz and I will help you get LAMH running. Alessandro and Kendall ~ I just wanted to pop in to say THANK YOU for all your hard work. Look at my Hair is wonderful. I've been a lurky-loo from the beginning of this thread, and I snapped LAMH up the instant it became available. Almost two years ago, I bought Carrara specifically because I could make hair in it, but I was never able to get a decent result. All I wanted was to create a character from one of my books, but it seemed impossible short of purchasing ZBrush, which is too expensive. 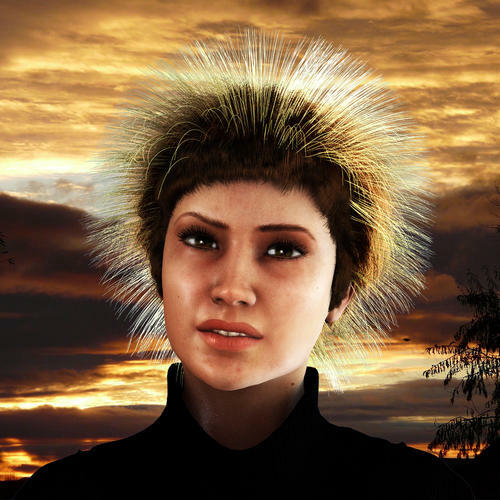 My character doesn't have normal hair - she's got a porcupine grafted to her head (specifically, a North American Porcupine), so bringing her to 'life' has been a huge challenge. I switched to DAZ because I really love Genesis, and now with LAMH (and a little persistence to figure out HOW to create her unique 'hair'), I've finally got my Bryn. That is awesome, Melissa! I'm glad that you were able to visualize your character. Alex and I want to thank you Melissa, and all of you here in the forums, for your support of LAMH. We'd like to let you know how much it means to have created a product that has been as welcomed as LAMH has. Kendall - i cant email you - i am not allowed access to the email consol. Ah, didn't think to change to matte (duh!) or mess with the specular. The lights were the Jasmin 'toon lights from 3DUniverse. Next time I try something I'll remember that. Nice model Rareth, I can tell your styling skills are really looking good. As we'll finally have collision detection, combing will be even much easier and effective. 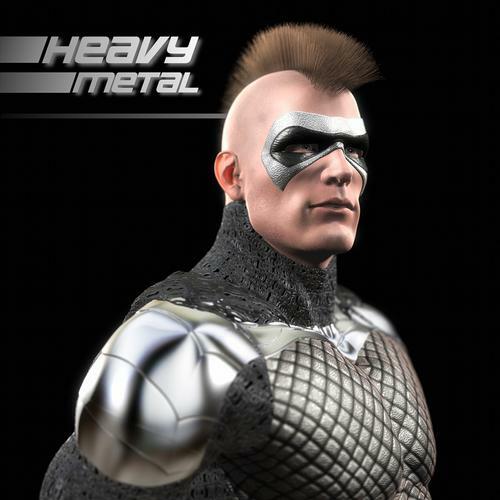 Character 'Heavy Metal' with Mohawk :) Submitted at Alessandro's request. Thanks for the great hair tool Alessandro. still working on shaping hair. Nice style Rareth, you're getting very good at it! Can this be installed on more than one machine? I installed on my desktop at home, I am now visiting family and trying to install on my laptop but the plugin won't seem to accept the auth. code. Hi RHale if you need another activation code, please email me the Serial Number displayed on the 2nd computer and I'll provide you the activation data. My email is: My email is info_at_alessandromastronardi.com (replace "_at_" with "@").